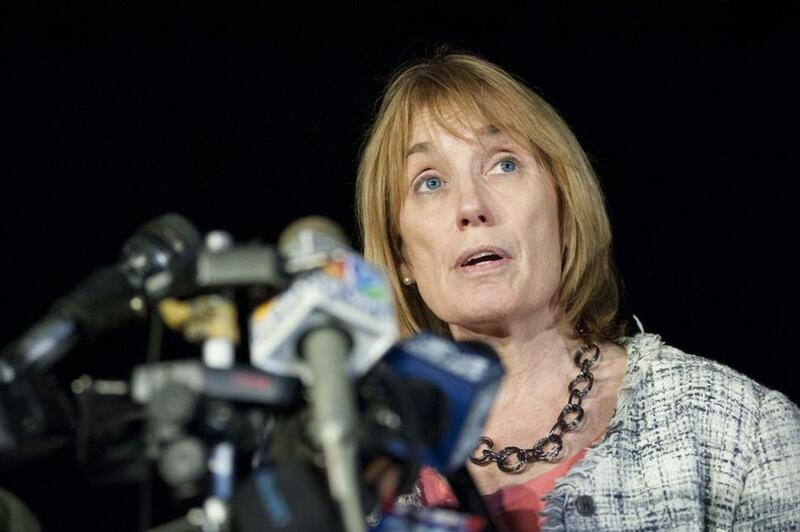 New Hampshire Governor Maggie Hassan. Authorities in Massachusetts and New Hampshire are cracking down on “synthetic marijuana,” a drug that has been linked to a series of recent overdoses as it remained on store shelves despite federal attempts to ban it. In Massachusetts, the Legislature recently passed a state ban on such synthetic cannabinoids, which are also known as “spice.” Though the products are often identified as incense and potpourri, authorities say they are widely smoked or brewed into tea. New Hampshire is one of the few remaining states without an explicit ban on synthetic cannabinoids, though the state’s officials say they are studying how to craft an outright ban. That’s a difficult proposition, because the drugs’ chemical compounds change regularly as producers seek to evade regulation. Dr. Jose Montero, state public health director for New Hampshire, said that though the drugs are regularly compared to marijuana, they can be much more dangerous — and their effects difficult to predict. A Pelham store owner has been arrested for selling a synthetic marijuana linked to a spate of overdoses in New Hampshire. Multiple attempts to reach suppliers of the substance were unsuccessful Friday. The US Drug Enforcement Administration classified many of the active ingredients in synthetic cannabinoids as controlled substances in 2011, and this year has been expanding its efforts to rein in spice and other synthetic drugs — including bath salts and Molly. But in areas without state or local laws prohibiting the drugs, police can’t enforce the DEA ban without the help of federal agents. Authorities say they have been further challenged by the rapid changes in the formulas of the substances — alterations they believe producers make in an attempt to circumvent laws and regulations against the distribution of specific chemical compounds. In a statement announcing the New Hampshire emergency declaration, Hassan said the state has found controlled substances in other brands of spice. But she said she took the step of calling out “Smacked!” after at least 41 people experienced “serious medical reactions” to it since Monday — including 20 taken by ambulance to hospitals. The state has no reports of deaths from the drugs, but Montero said there have been a variety of symptoms: passing out, hallucinations, and cardiovascular distress are some examples. Dr. Christopher Rosenbaum, director of toxicology at Newton-Wellesley Hospital, said people who have smoked spice products have also suffered from agitation, nausea, and vomiting. There have been some reports of seizures. He applauded Hassan for taking strong action against the products. Massachusetts health officials said Friday that while they are aware of anecdotal reports of overdoses from synthetic drugs, there have not been any large-scale problems like those seen in New Hampshire. McKenzie Ridings, a spokesman for the Boston Public Health Commission, said, “There haven’t been any real problems” in the city. But Anne Roach, a spokeswoman for the state Department of Public Health, said a substance abuse bill recently signed by Governor Deval Patrick gives the agency emergency powers to temporarily ban dangerous products when circumstances warrant. “This action gives law enforcement the tools it needs to crack down on these emerging drugs,” Roach said. Another new Massachusetts law banning synthetic marijuana has a provision intended to prevent chemical alterations from circumventing the rules, according to Senator Michael O. Moore, a Millbury Democrat who pushed for the change. Moore said he became interested in the issue after a constituent told him that young people were becoming ill after using the drug. An effort to ban synthetic marijuana fizzled in 2012 amid a successful campaign to crack down on drugs known as bath salts, but passed as part of a budget deal in this year’s recently concluded legislative session. Law enforcement officials in Moore’s district are reaching out to store owners in the area to let them know about the ban on spice. Information from the Associated Press was used in this report. Andy Rosen can be reached at andrew.rosen@globe.com. Michael Levenson can be reached at michael.levenson@globe.com.